And I was going to have to associate with these people. On crossing the border from Paraguay into Argentina, I found I couldn’t afford my own room, so had to book into a six-bed dorm in a hostel. The deal on the first night was an overpriced barbecue with free caipirinhas. By 8pm, the whole joint was bouncing with screaming twenty-year-olds. I used to knock myself out with booze to get to sleep, but in sobriety I’d found I could get the same results with a carbohydrate overload. I went out and bought a family size bag of biscuits, then sat in bed and ate the whole lot. It worked… until 5am when I sat bolt upright. I had to do 500 sit-ups to burn off the excess energy. It made the bed squeak quite a bit. So in Buenos Aires I bit the bullet and forked out a ransom for my own windowless, sickly-looking room in the blue-collar, Tango-dancing district of San Telmo. I had to get out of that room. I walked the city’s gloomy streets for three hours. The Argentine capital in the depths of winter was much like London – big, dirty, expensive, grey, aloof. It left me… cold. The Habla Inglesa meeting was held in the basement of a Methodist church slap bang in Buenos Aires’ centre. It was made up of about 20 men and two women, all Caucasian, mostly North American. “The other night I went out to the shops and I spied some cookies that were the type I used to eat as a child in Peru,” said a dapper dresser in his forties. “So I bought a family-size pack, took it home and began eating, but I found I couldn’t stop. I ended up eating the whole lot, like a typical addict, then fell asleep in my chair. A young Brit, who had been laughing with glee, was keen to comment. After the meeting, the Brit introduced himself as Kevin and invited me to join him and the others at a pizza restaurant. “I much prefer Brazil to Argentina,” he confided. “I came out to Argentina seven months ago to learn Spanish. I go home this month, but I sometimes wish I’d gone and learnt Portuguese in Brazil instead. He began doing a little jig in the street. We looked around at the sedate streets. Serious-looking, well-dressed individuals pounded the pavements with their heads down, as if deviating from their route straight home to bed may be a sin. There was none of the beery bonhomie and lager-lout lariness of a Friday night in England. For a pair of blokes raised in Britain, it was a little unnerving. “The Argentines need a chilli pepper sticking up their arse,” concluded Kevin. I was surprised. “I thought Buenos Aires was meant to be a party town,” I said. In the pizza restaurant, there was one guy drinking beer. He was even drinking alone – and it was the Argentine beer, Quilmes. The beer is named after the indigenous people of Quilmes who held out in their fort, a last bastion of fierce resistance to Spanish rule, as the conquistadors besieged them with starvation in 1667. The women were said to have thrown their children over a cliff rather than have them suffer. When the fort finally gave, the Spaniards found only women, children and injured men. Every able-bodied man had fought to the last, enshrining their bravery in Argentinian folklore. Still, it’s somewhat ironic that those who now drink Quilmes – Argentina’s biggest brewer with an 80% share of the beer market – are toasting a people who died of hunger and thirst. I watched the lone Quilmes drinker struggle with his food order. “Hablo pocito Espanol,” he slurred to the waitress. He was English. On the way back to my hostel at 11pm, I passed wild-eyed, grimy and dreadlocked hordes rummaging through the trash for recyclable material. The city’s recyclers, known as carteneros, descend at night from slums such as Ciudad Oculta, which are blighted by paco addiction. Since Bolivia began cracking down on the chemicals used to turn coca paste into the high-grade powder cocaine favoured by North Americans, cheap, low-grade cocaine – paco – has flooded Argentina instead. 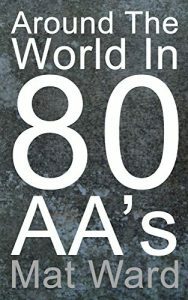 This is extracted from Mat Ward’s excellent ebook, ‘Around the World in 80 AA’s where he tours the world investigating the phenomenon that is Alcoholics Anonymous.’ Buy it now.